We ship with the top carriers in the country. 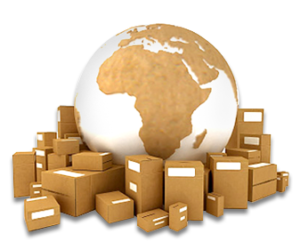 We use UPS, FedEx, USPS, and DHL International. 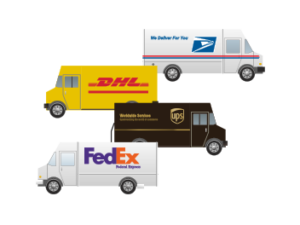 Since we utilize all of these carriers we are able to give you, our valued customer, the best shipping rate possible. We compare rates between all of the shippers and depending on the size, weight, and destination of your package we are able to give you the best deal. The choice is yours. Just bring your item into our shop and we will pack it up and ship it out with the carrier of your choice! Track your shipment from our online tracking link. If you ship with us and have a problem, call us, we will handle it for you. We handle address verification and lost or damage claims that save you charge backs and time. That’s the difference in a drop-off and shipping with us. MAILBOX RENTALS WITH A PHYSICAL ADDRESS! We have mailboxes available with a physical address. This means you can get your UPS and FedEx delivered to your box, which is not an option at the Post Office. 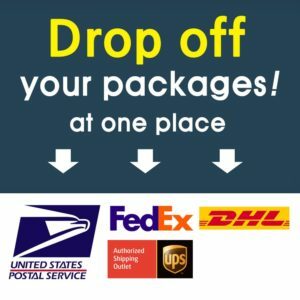 We are happy to hold your packages and if you are looking for a particular piece of mail/package just give us a call and we will be happy to look for you instead of you having to get out and come look for yourself. We go above and beyond to take care of our customers in any way that we can. Our best deal on our mailboxes is the yearly deal plan which is $100 even no hidden fees. Everything Office, Janitorial, Safety Supplies, Break room Items. Click on Office Tab and explore 60,000 plus items.